Explore our outdoor blinds, outdoor shades and patio blinds in both contemporary and traditional styles. Customise your exterior shades to fit your windows, stoops and patios all available in a wide range of fabrics. Outdoor shades and patio shades like our outdoor roller blinds range; diminish glare and help block harmful UV rays while allowing you to see out. By installing outdoor patio blinds you can reduce cooling costs inside your home significantly. Made from all-weather unique breathable woven fabric, these outdoor blinds create a pleasing atmosphere for any patio, veranda, deck or sunroom. Blinds Direct offers a wide variety of patio blinds and outdoor shades from Coolaroo in many colours to match the exterior or style of your home. Why choose Outdoor Patio Blinds and Shades? 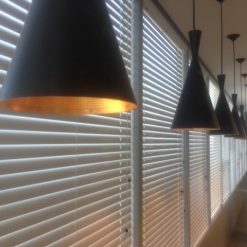 All our products whether its outdoor blinds or patio blinds, are made from high grade raw materials with superb finishing. This is the reason why they enhance the look and feel of your living space and last for years. 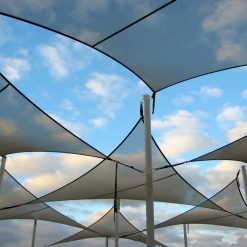 Our outdoor shades are made from a shade weave fabric also known as shade mesh. This is a high tenacity vinyl-coated polyester ShearWeave fabric that will not distort even with constant use. This special outdoor blind allows heat to be regulated through the fabric, keeping a comfortable, even temperature. Even though they block the sunlight, outdoor shades don’t block your daytime view. Offering 88- 95% wind & rain protection and protects you from harmful UV rays, our outdoor shades and blinds gives off a stylish contemporary look while providing you with privacy and preserving the views of the outdoor area. 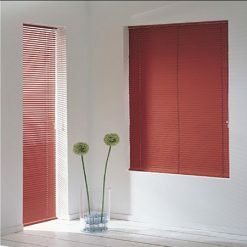 Patio blinds and shades also offer protection if you live in an area that is windy or dusty. Patios get plenty of use when the weather’s nice and patio blinds can protect your patio furniture, surface and grills throughout the year come winter or summer; while giving you privacy and adding an elegant touch to your surroundings. Don’t put up with heat or glare and protect yourself from wind and rain! Blinds Direct offers the best solutions to enhance your outdoor living with our range of outdoor blinds, patio blinds and outdoor shades. Make the most of your outdoor living areas with our selection of outdoor blinds, patio blinds and outdoor shades. Get the look you want with a wide range of colours and patterns.